When I first saw commercials for Garnier’s new ‘OIL POWERED’ hair dye I was very intrigued. Hair dye is something I have become very acquainted with over the last six years. Many women under 30 still enjoy the opportunity to dye their hair for fun, a little highlight in the summer, going dark for fall, etc… For me it is straight up maintenance. To dye or to look like I’m pushing 50, that’s the situation. You see, I have (what I like to refer to as) shoddy genetics AKA crazy amounts of gray hair for someone who doesn’t have a mortgage, children or an AARP card. No offense, I’m a big fan of the silver foxes, my mother is one and she wears it very well (a glimpse into my future, I hope). None the less, her genetics in combination with my fathers have resulted in my serious box-dye habit, at least 1x every 3 weeks. Olia appealed to me because I figured; at the rate I use the stuff, it sounded like a much healthier and moisturizing way to chemically alter the color of my hair. In other words, I drank the Kool-Aid. 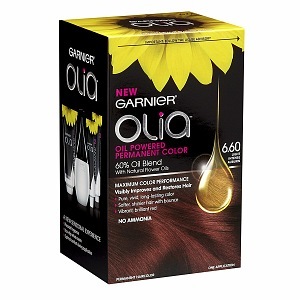 The ad campaign with all the shiny hair spoke to me and I grabbed my keys and high-tailed it to CVS to pick up Garnier Olia Hair Dye in Dark Brown 4.0. So inside the package you will find the usual, developer, colorant, conditioner, instructions and gloves. The only odd thing I noticed was neither the colorant nor the developer was in the application bottle. Personally, I think this is a packaging mistake and leads to product loss. The dye smells amazing. Not chemically, not particularly strong – just light and floral. To test the strength I followed the packaging instructions, did my roots first, combed it through the rest and left it on for 35minutes. After I washed it out, the color that took to my hair was great. Shiny, dark and even and then I checked my grays… still there, as proud and obstinate as ever. I was very disappointed; I wanted so badly to get away from the stinky dyes and the occasional irritation that my skin went through. I had to try again! On the second go-round, I pulled out all the stops, every trick I had learned over the years. I took my time working the dye into my hair, pinned it all up, wrapped it in a shower cap and left it on for a longer time. After almost 50 minutes, the heavens parted and my grays were gone. My hair was really shiny, vibrant and healthy looking. It’s too bad that I couldn’t follow the instructions on the package but I couldn’t be happier with the results! It is definitely a product that I would recommend to anyone looking to not only keep up with maintenance but maybe try something new! I’m happy to say that Olia will keep me out of silver fox territory for the foreseeable future.